Gout - Any Safe And Natural Remedy To Relieve My Pain? 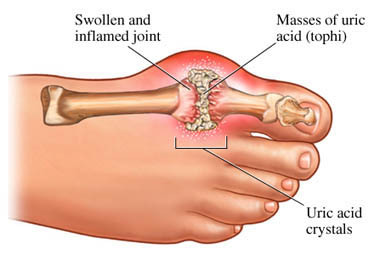 Gout is a condition where uric acid crytalises at the joint (usually toes) areas and causes severe pain. There are a few causes of gout. One of main cause is high uric acid content in the body although this does not necessarily always lead to gout. Other causes of gout could be kidney failure/weakness and poor blood circulation in the area that was previously injured (causing immobility). The kidney is responsible for removing the uric acid from our body. There are many types of medications to treat gout and many of them have side effects. Colchicine is commonly used to relieve pain. However, side effects reported include gastrointestinal upset and neutropenia (abnormally low number of neutrophils, a type of white blood cell). High doses can also damage bone marrow and lead to anemia. The good news is, whichever the cause of gout, Lingzhi can help to improve the condition because it cleanses our blood, improves blood circulation and improves our kidney function as well. It is best if taken together with Vitaking because the Lemon Verbena in the Vitaking helps reduce inflammation of our joints (which is common for gout) and builds back the cartilage. My friend's father who suffered from severe gout took 12 lingzhi plus 24 pollen daily for about 3 months. He observed significant improvement in his condition. Please email me at laifuiping@gmail.com if you're looking for a safe yet effective option to handle your gout agony.